Michael Keith, the author of the above website, has created several works in Pilish, including a full-length book covering the first 10,000 digits of pi! Trying to write under such constraints can feel extremely awkward, but this made me wonder: How often would strings of words adhering to the constraints of Standard Pilish occur unintentionally? Afterall, with the amount of text out there – the sheer rate at which words are being put together by people all over the world every second of every day – it is to be expected that these things should occur with some frequency p > 0. Such is the Law of Large Numbers. Somewhat disappointingly, the longest of any Pilish string was 8 digits of pi. The vast majority of books had a longest Pilish string of around 3-5 words. See the histogram below (note the logarithmic scale in the y-axis). “Certainly, Mr. Holmes ; help yourself.” She pointed to the olla hanging in the shade of the ramada. I was weary of the humdrum life of idling on shore or aimless sailing up and down the channel. The admiral’s was a peaceful mission, and no fighting was expected, but I felt a great curiosity to behold new scenes. And I have a great Objection to firing with powder only amongst People who know not the difference, for by this they would learn to despise fire Arms and think their own Arms superior, and if ever such an Opinion prevailed they would certainly attack you, the Event of which might prove as unfavourable to you as them. One was part of the empire, the other was enclosed in Poland, and they were separated by Polish territory. They did not help each other, and each was a source of danger for the other. They could only hope to exist by becoming stronger. That has been, for two centuries and a half, a fixed tradition at Berlin with the rulers and the people. They could not help being aggressive, and they worshipped the authority that could make them successful aggressors. That last one is the only of the five to have one word of double-digit length, thus covering two digits of pi (‘straightforward = 15 letters = ’15’). I would like to do a similar analysis of an even larger dataset of more modern language. One possibility is a full archive of Wikipedia. I wonder what is the longest string of unintentional Pilish ever produced? 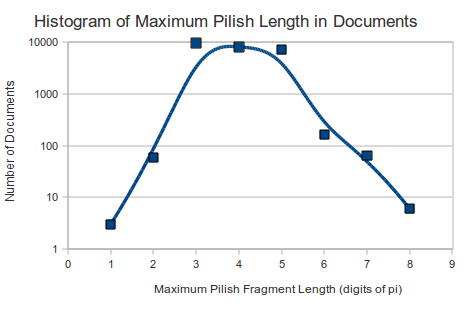 Another interesting question is how the maximum length of Pilish sections in a document scales with the length of the document, and how well this can be modelled with a simple statistical model such as a Markov Chain.